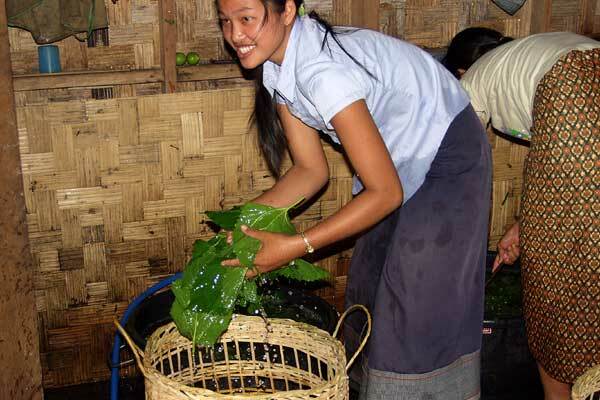 Mulberries are at the center of Vang Vieng Organic Farm’s operations. We use the berries in our delicious shakes, pancakes, wine, stir-fries, tempura, and, of course, to make our Mulberry Green Tea. Leaves & stalks from the mulberry trees are fed to our animals. You can find all of these on our menu & for sale as well as at various establishments in Vang Vieng, Vientiane &Luang Prabang. We use mulberry leaves mainly for making our celebrated Mulberry Green Tea. The day starts with selective picking of leaves early in the morning. The freshly picked leaves are washed. Leaves are then cut into thin slices & boiled. After steaming & cooling, the leaves are dried at low heat. The drying process is done carefully by stirring with the hand to ensure even heating & a good finished product. The finished product is hand-packed into bags of various sizes & available for sale. Mulberry tea has many benefits for the bodies health. Mulberry leaves contain a number of important nutrients, including phytosterols & antioxidants such as beta-carotene & alpha-tocopherol. Tests in Japan have shown that these nutrients can reduce the occurrence of diabetes & heart diseases. Like most green teas, mulberry tea is good for good health & it tastes great! And tea made from organic mulberry trees is the best of all! We offer our organic mulberry tea for sale at the farm & in retail outlets around the world. If you are interested in obtaining tea for your own use or in bulk for resale, please email us at the address listed on the CONTACT US page.